​One of the most crucial aspects to a player's journey in Fortnite to that sweet Victory Royale is deciding where to drop and how to loot it correctly. The meme "Where we dropping?" wasn't just made up out of thin air. Now that the areas have been outlined, let's look at how you should go about looting and staying alive in these areas. Yes, Tilted Towers is by far the most tilting place to land in all of Fortnite, but it also has the most loot of any area simply because of the size of the area. Staying alive in Tilted Towers is just as important as finding the best loot possible. The best part, though, is that loot drops are high, so knowing the best buildings at which to drop will increase survival rates and also the amount of kills you secure before moving out to the next location. The buildings you want to target are on the two opposite ends of Tilted: the Clock Tower and the building next to the double L buildings (Texas, Fish, etc). These buildings not only have strong-to-decent loot spawns, but the rotations toward the center of the area make it easy for you to divide and conquer without worrying too much about getting flanked. Also, if players happen to glide to the building faster than you, there are secondary options around your points of interest that make landing safely that much easier. The Clock Tower in particular has a maximum of three chest spawns. You can then rotate lower to the pawn shop, east toward the C building, or west into the apartment complex. Get your loot, move inward toward the twin buildings, the giant brick building, and the open roof building to clean up kills and maximize your inventory before leaving the hellhole that is Tilted Towers. Retail Row is ​divided into two sections: the retail side and the residential area. Landing at either side isn't a bad choice depending on your style of play, but the retail side has the added advantage of having a high ground advantage looking over the residential area. Focusing on the retail side as the residential area is as simple as moving from house to house; three possible chest spawns to consider are all on the water tower side. There's one that can spawn on top of the water tower, one in the cafe next to it, and then one in the top of the bookstore next to that. The riskiest part of the water tower chest is that you're completely out in the open and have to break your way down so you don't take fall damage. If you can successfully do that, though, and get one of the next two possible chests, you should be set up to move out to the Bass Pro building and the supermarket. From there, clear out people fighting in the residential area and rotate toward the factories, Salty Springs, and Dusty Depot. Easy money. The two farms of Fortnite are pretty similar in terms of their layouts and loot spawns, so we're clumping them together. Aside from niche chest spawns like under the bridge in Fatal and the dump truck in Anarchy, the most popular areas to land are the big barns, the long barns/stables, and the houses. Depending on the randomness of the spawns in those areas, it's basically a battle of who gets the better loot and kills the other players quicker. The benefit of landing at the farms is how easy it is to rotate to other areas after clearing out a farm. Based on how the safe zone develops, Tomato Town, Lucky Landing, and Salty Springs all make for great secondary loot areas and picking off stragglers. Pleasant Park is all about landing at a house and landing quickly. Seriously, don't get caught in a situation where you pick a house at which to land, someone lands there quicker than you, and then you're scrambling to find another house. All that will lead to is you walking into a player upstairs with a shotgun ready to end your game. The house with the cellar, the tree house, and the dog house are all popular landing places. Each house has a bunch of possible chest spawns for looting. Bonus spots include chest spawns in the middle of the soccer field and under the gazebo in the middle of Pleasant Park. Action at Pleasant Park can either be close to Tilted Towers or as low as Flush Factory. It all depends on the route of the Battle Bus. The only downside of the area is that players are essentially funneled into running toward Tilted Towers if you don't get enough loot. Also the mid-game action is pretty lackluster in comparison to other areas. Keep that in mind when considering this area. There you have it. A method to the madness that is picking a landing area in Fortnite. 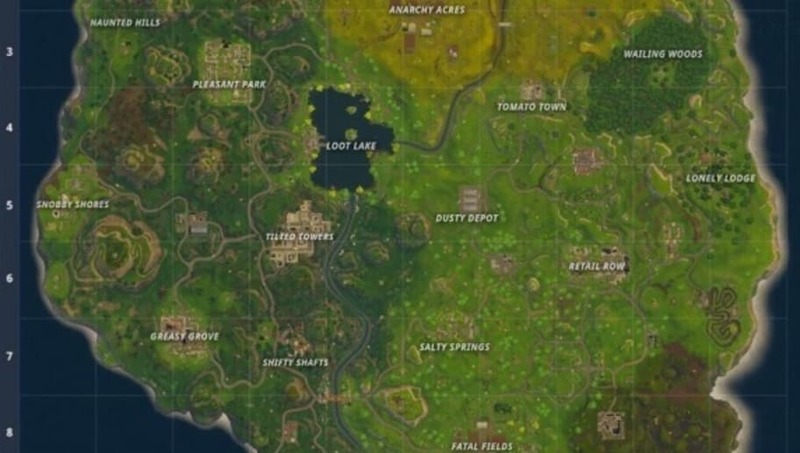 Each area has a level of difficulty so newer players should stray toward the farms instead of Tilted Towers immediately.Remember, pick an area, pick a spot, land quick, loot up, and take out the competition.